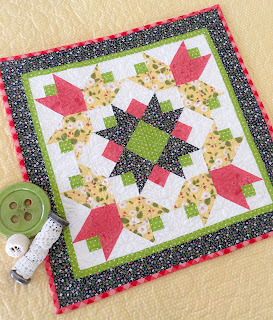 You did a wonderful fabric pull for this quilt, very pretty! This pattern has been on my (very long) to-make list for a long time, I think I will have to tackle it soon. Thanks Cathy! I did enjoy gathering these pretty fabrics! Yep, you'll have to tackle this one soon! It's fun! That's so kind of you Rosemary! Have a great day! I too love everything that you create! I wish I had your ability to choose fabrics that always look better in the combination that you make than they did individually. That came out wonderfully...I love it...good job. What a lovely quilt, Taunja! You did a beautiful job of choosing all these pretty fabrics. I'm really eyeing your 'Let's Play' pattern. So many beautiful patterns to choose from. Thanks Sigi! Let's Play is pretty fun! I look forward to making it in some brighter colors too. And while it lends itself to a little boy, I know it would work for a little girl too. Fun as a play mat!